*Collect In Store - if you would like to collect your bike in store, please use our Click & Collect payment method or call 0118 9821021 to reserve and ensure your bike is ready for your arrival. ETAs are based on manufacturer's latest data. Please note: this Trek Checkpoint SL 5 Women's is available for in store collection only. This is a global policy of Trek Bicycles. If you would like to purchase this model we recommend using our Click & Collect payment method to reserve your bike online. This Trek Checkpoint SL 5 Women's 2019 is available with our legendary Podium Point free accessory scheme. IMPORTANT: This bicycle is supplied without pedals. 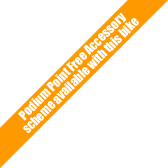 Pedals for this bicycle can be selected for no cost using Podium Points™. Sizing information is provided as a general guide only. This is based on the average rider riding the bicycle in the style for which it is intended. This takes no account of a rider's personal proportions, physique, flexibility and biomechanics. If your height places you on, or near, a bicycle size step then we recommend you consider both sizes. All bicycles offer a range of handlebar and saddle adjustment which will enable you to fine tune your riding position once the correct size has been established. If you are unsure on sizing, we strongly recommend you visit our store so we can assist you. Pedal On offers advice and information on sizing in good faith, the final decision and responsibility on which size to purchase is yours. The following finance options are available to apply for online immediately. If you are collecting your bicycle in store you can arrange your finance prior to visiting the store by selecting the required finance method as well as Click & Collect. The credit advertised is provided by one credit provider with whom we have a commercial relationship. Credit provided by Hitachi Personal Finance, a division of Hitachi Capital (UK) PLC Authorised and Regulated by the Financial Conduct Authority.